What’s the First Step?The Psychology of a Habit The Habit Loop4 Overspending Habits and How to Change them How long does it take to change a habit? Do you have a bad spending habit? Have you ever tried to change? It’s tough! We know. Part of being human is building habits and and it’s hard to change them. But if you understand and use the habit loop—changing a habit is easy and fulfilling. When Americans were recently polled to see what the most common bad financial habit is, the top result wasn’t a lack of saving money or not paying down debt. The top “bad” financial habit of Americans is actually overspending. It’s easy to see why this is the case, because let’s face it: we’re all guilty of overspending. For you, maybe you overspent at a recent dinner, purchasing dessert when you hadn’t budgeted for it. But hey, it was a special occasion, so why not? Or maybe you had reached your budget for your holiday shopping, but as you walked out of the mall, one item in a store caught your eye and you just had to have it—even if it meant going over your budget. And this has happened not just once or twice, but for years. Maybe it was on a far grander scale: overpaying for a car, a boat or perhaps even a house. Boxer Floyd Mayweather spent $20,000 on a golf cart and $18 million on a watch (which is “set with 260 carats of emerald-cut diamonds”). Professional basketball player Al Jefferson spent $23,000 on a single bed for himself. If you thought your recent bar tab was expensive, chances are it wasn’t more than the Miami Heat’s who once spent of $200,000 at a bar. Wanting some peace and quiet while traveling, professional football player Vince Young chartered a public flight for himself on Southwest Airlines from Houston to Nashville, purchasing nearly all tickets for the flight, which cost over $20,000. Angelina Jolie bought Brad Pitt a helicopter for $1 million. 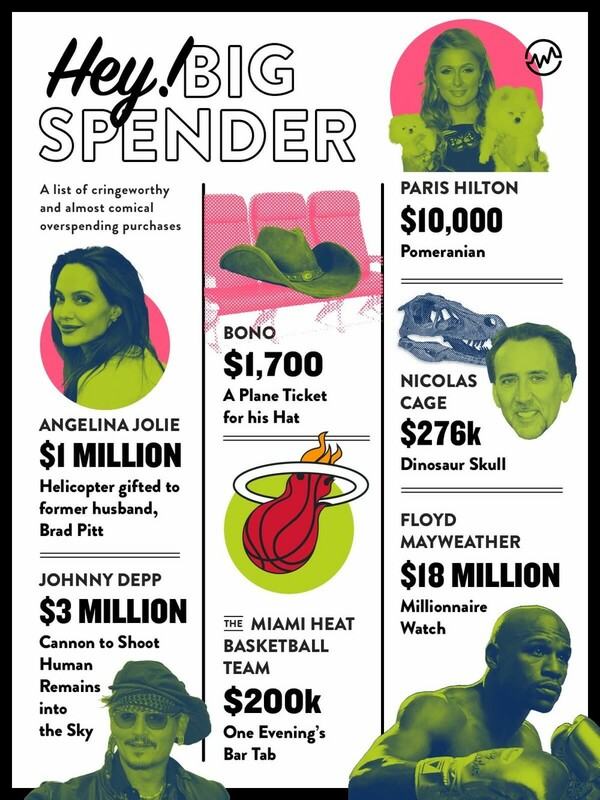 Nicolas Cage coughed up $276,000 for a Dinosaur Skull. Mike Tyson spent $2 million on a bathtub. More often than not awareness isn’t the problem. You know exactly when you’re overspending; the problem is you don’t have the discipline to stop. Contrary to popular belief and many self help guides, it’s not about telling yourself “just don’t overspend” or making yourself feel guilty. There’s a psychology behind the habit of overspending. Like any habit, making a change is challenging. But if you create a plan that ties psychology to your goals, you will achieve it. Thanks to science, we know that a habit isn’t some unknown “thing” embedded deep within our psyche. Habits can be studied, analyzed, and as you’re about to see, they can be manipulated and altered for good. This is the theme of Charles Duhigg’s fascinating book The Power of Habit: Why We Do What We Do in Life and Business. Duhigg explains that habits aren’t inherently bad. In fact, we have the ability to create habits so that we don’t have to relearn things like driving, opening doors, or other second nature tasks. When a habit is formed, the brain stops fully participating in decision making, diverting focus to other tasks. This is how we can multitask. Where we get into trouble, though, is when the brain can’t differentiate good habits versus bad habits. And, unless you deliberately take hold and fight, a habit will form time and time again. 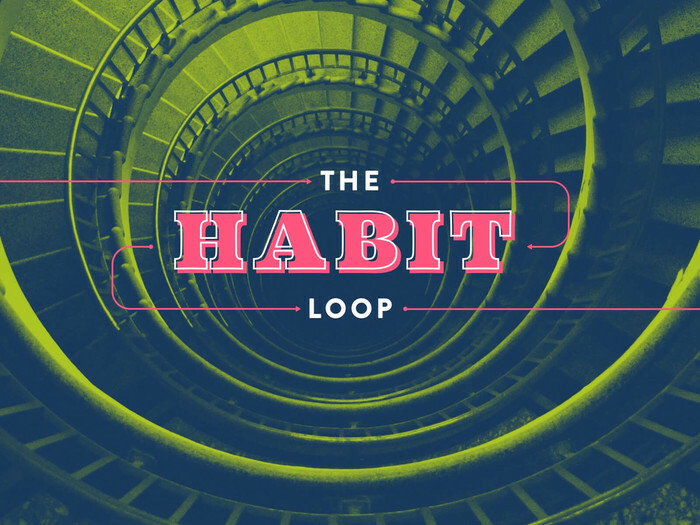 Duhigg says we can change bad routines if we understand and manipulate the habit loop. 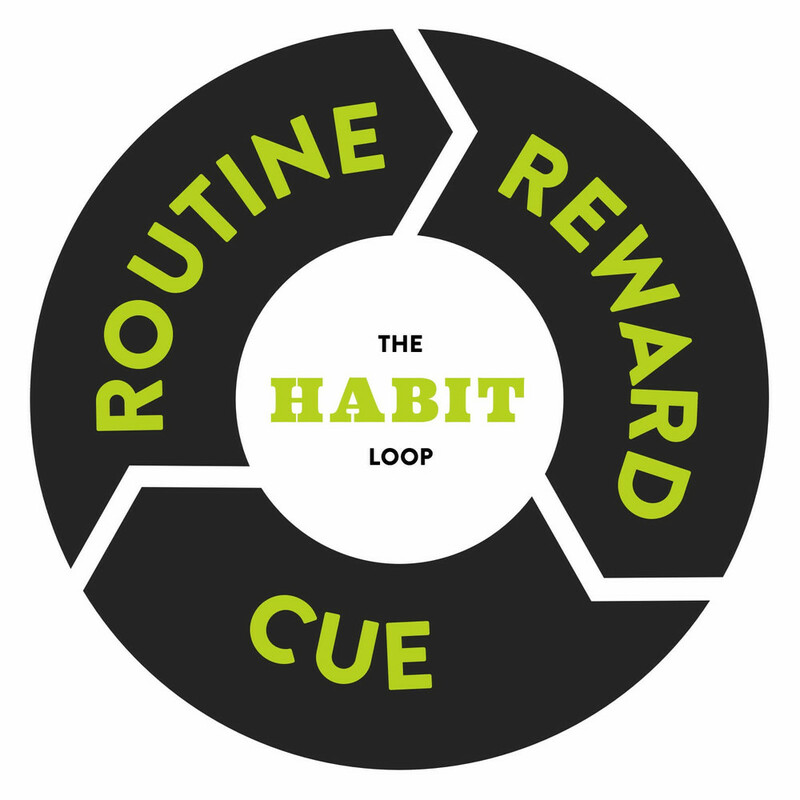 A habit begins with a cue. Something creates a trigger—stress, excitement, or anxiety—and the habit loop begins. After the cue is a routine. And finally, a reward comes, a hit of dopamine that provides pleasure after the routine is completed. Make sense? Let’s say it’s Monday morning. Because you’re stuck in traffic, you’ll likely be late to work. You begin to stress. This is the cue. Once you feel stressed, you begin to bite your nails. This is the routine. Then you feel a sense of relief by doing the stimulating action. This is the reward. Maybe another cue is a feeling of restlessness. The healthy routine in this case is running. The reward is a release of endorphins, known as “Runner’s High”, and you feel better after your workout. Here’s the key: nearly any behavior can be transformed if you keep the cue and the reward the same. Thus, habits are changed when a new routine is inserted into the loop. Let’s take a closer look at this process by looking at 4 overspending habits and how you can begin changing them today. Problem Habit: Using credit cards because you can’t afford items that you want. Solution: Create a Side Hustle or Micro Business. The average American has a credit card balance of $6,375, according to Experian. Those who falls into the trap of large credit card balances do so for one reason: you want something you can’t afford. It’s the opposite of delayed gratification: it’s immediate gratification, with an understanding you’ll have to pay it off—plus interest—at some point down the road. This desire is the cue: it’s what triggers overspending. 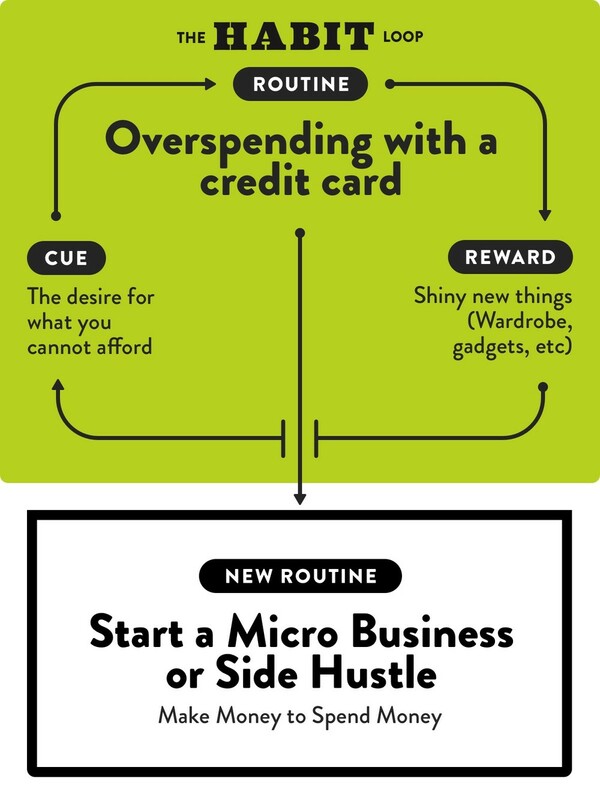 Using credit cards is the routine—swipe, swipe swipe—and the dopamine-rich reward is the item. Of course, this is a vicious, financially irresponsible cycle—racking up credit card debt with no end in sight. Let’s look at the cue. Although you feel guilty, there’s nothing wrong with wanting something you can’t afford (unless it’s outrageously beyond your income). So, don’t touch the cue. Moving on to the routine—using credit cards—that is what we change. Utilize the time you previously spent using a credit card and instead, build a side hustle or a micro business, which are ways that you can generate extra income alongside your current 9-5. The reward—like the cue—stays the same. After you earn extra money via your side hustle or micro business, you use that cash to pay for the items that you previously couldn’t afford. Problem Habit: Overspending for convenience. Convenience spending—paying extra for goods and services simply because it’s more convenient for you at the time—absolutely drains your bank account. Let’s take eating out as an example. Did you know that most food establishments charge a 300% markup on the items they serve? So for a meal that costs $15, the food you're eating only costs $5 to make. Eating out every so often is okay, but going out for lunch multiple times per week? Another convenience spending example is using an out of network ATM fee because you need cash instantly. The average fee of using an out-of-network ATM is now $4.57. Ouch. The cue for this overspending habit is instant gratification: eating out on the way home because you aren’t interested in cooking at home or shrugging your shoulders and paying an out of network ATM fee time and time again because the fee doesn’t seem too expensive. Remember, there is nothing wrong with convenience. It’s what comes next that needs to change. Instead of spending for convenience, plan ahead for tomorrow. What does this look like? Visit the grocery store. Make lunch for yourself the night before. If you know you’ll need cash later on in the week, make an extra trip to obtain the cash from a non-fee ATM. The reward, convenience, won’t change. By preparing for the moments when you’ll want instant gratification, you can actually create a good habit by having that gratification ready. 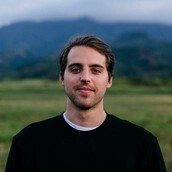 Problem Habit: Making financial deals at face value. 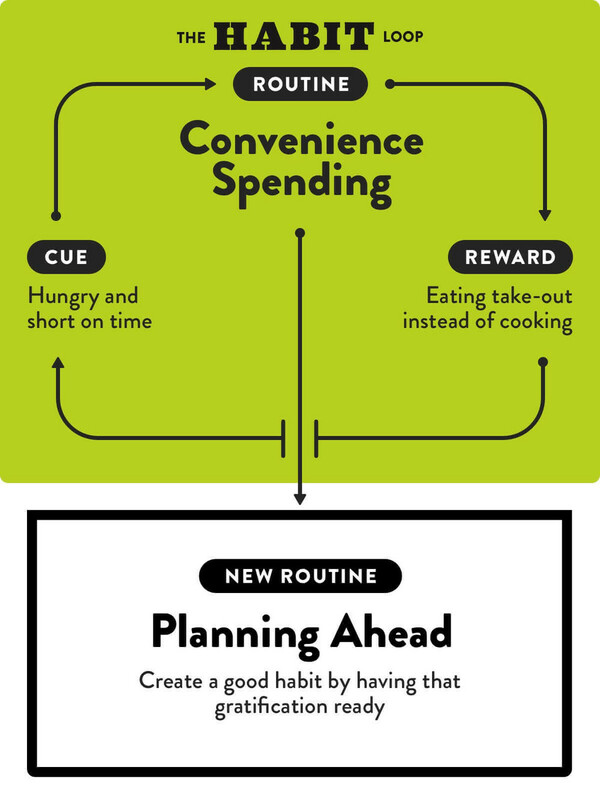 What do all of these habits have in common? Call it research or homework, it could be a few Google searches to watching a market over a specified amount of time or taking online courses. 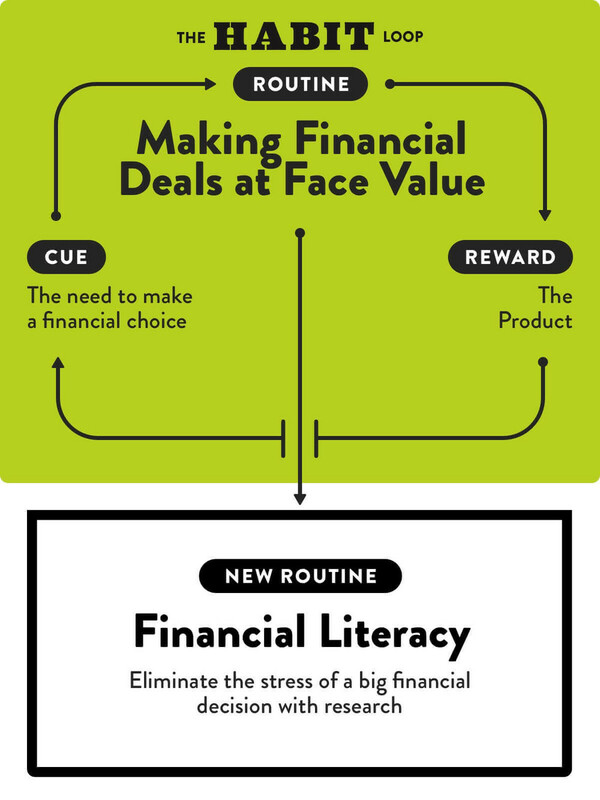 The cue for this habit is the stress that comes from having to make a major financial choice. The routine is deciding quickly to eliminate the stress. When you make a quick decision your reward is the elimination of stress. Instead of being quick to pull out your wallet, replace the routine with financial education and research. Either way, you’ll make a decision. But the routine you use will decide whether or not it will be a good deal. Want a new car? Don’t ever buy a car the first day you step onto the lot, ignore the car salesman. Shop around at other lots and find a better deal. Make it known that you’re doing so, you may get a deal from it. Also question whether your desire for one is justified: do you really need a new car? Want to move into a new apartment? Don’t jump at the first apartment you find. Give it some time learn the market patterns. Many markets are seasonal. By waiting for a different season, you may save hundreds. Is there a specific item you want to purchase for the holiday? Don’t wait until the last minute when you have to pay full price at the store. Plan ahead and shop around. Chances are you can find it for a better deal. Problem Habit: Buying without budgeting. About 49% of Americans make purchases without a budget. This is the easiest way to overspend and constantly deplete your accounts. Ever had the thought “I just got paid. Where did all my money go?” That’s a bad habit. The cue is a desire to purchase goods and services. Having accountability. Sometimes it’s good to get professional help, and sometimes friends and family can fill this void. The reward for this loop is obtaining the goods. But by budgeting instead of not sticking to a budget, you’ll obtain goods and keep your finances on track—a much healthier cycle. Enacting one or all four of these changes a few times won’t make much of a difference psychologically, or financially. Like with most changes, it has to be done repeatedly to have a real effect. How much time does it take to change a problem habit into a good habit? Research says it can vary from individual to individual. Recent studies say it takes 21 days while others say 66 days. Either way, it’s not about reaching a specific magic number. First, the goal is to understand the psychology behind overspending habits, and second, begin to alter the routine to change the habit. Do this, and not only will you be better off financially in the short term. Your future self and your future finances are guaranteed to thank you. What habit stresses you out and drains your bank account?